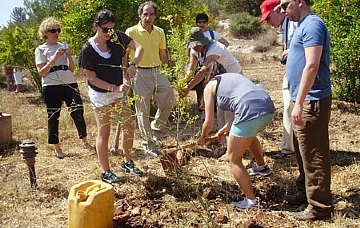 Tree planting is a unique experience that carries on flourishing long after your trip is over. You are invited to plant an olive tree on one of our ancient terraces in our “Grove of Light Project”. These are a group of terraces that will eventually fill up with 500 numbered olive trees planted by individuals wanting to create a living memory of a loved one or occasion. This can be planted in honor or in memory of someone or dedicated to a family member or friend to mark a special occasion like a Bar/Bat Mitzvah, wedding or birth of a child. We will provide you with a personalized certificate to mark the occasion. You will also receive a map pinpointing the location of the tree you planted and its number. You are invited to visit your dedicated olive tree at our Biblical Park on future trips to Israel (this needs to be coordinated in advance). 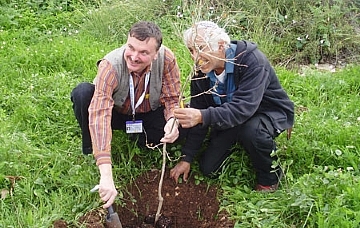 Our Ceremonial Tree Planting Center is located on one of Neot Kedumim’s hilltops with breathtaking views of the Samarian Hills on one side, and the skyline of Tel Aviv and the Coastal Plain on the other. The Hertz Tree Planting Center was planned, designed and built taking into careful consideration elements of design, construction and development. Emphasis was also placed upon environmental conservation, using recycled artistic components and materials which are appropriate to the tree planting site and the Nature Reserve. 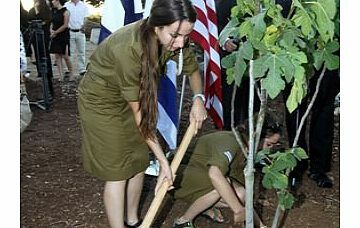 The JNF planting center is suited to tourists traveling as part of a group, organized missions or individuals. The center is handicap accessible. This hidden gem of Israel is located between Tel Aviv and Jerusalem, in a quiet picturesque nature reserve. 625 acres of hills and valleys have been ecologically restored to their former glory of ancient times – the land flowing with milk and honey. We have hundreds of varieties of biblical plants, olive groves and vineyards. Together they bring to life the world of the ancient scriptures, parables and the prophets. **There is a minimum requirement of 10 saplings per visit, with a prior reservation of at least one week in advance.